Enterprise Sentry™ from AlertEnterprise provides a unified Security Awareness and Situational Intelligence Suite that delivers Security Intelligence across the domains of Cyber Security; Physical Access to facilities and assets; and Operational Technology like SCADA or Industrial Control Systems. Consolidated cyber, human and asset intelligence delivers un-matched abilities to correlate threats and deliver smart decision support to interdict events before they occur, and mitigate the impact from incidents that are underway. In additional, Enterprise Sentry provides visual risk detection with geospatial monitoring, event correlation and alerting accelerate informed response, while delivering true situational awareness and incident response. Piecemeal solutions addressing safety and security threats from segregated IT, Physical and OT silos are fragmented measures that leaves critical infrastructure fundamentally exposed. AlertEnterprise delivers a purpose-built and proven solution that bridges the gaps and strengthens security across enterprise. 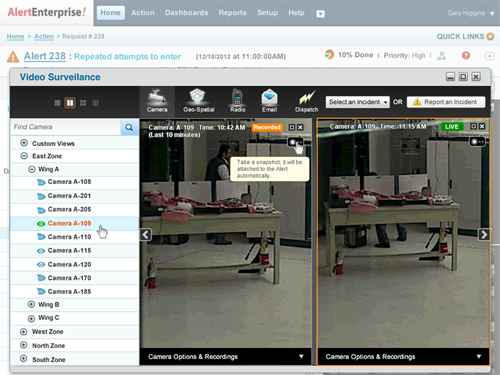 Enterprise Sentry helps security personnels make intelligent choices when responding to alerts. In addition, our solution provides ability to define policies and automate many of the processes to help save time. Our solution provides a unified approach to remediate threats while managing events from physical and logical systems. Enterprise Sentry delivers the capability to tie together multiple seemingly disconnected events to actually identify potential security incidents prior to occurring, or at least very soon after. Early detection can help prevent incidents or mitigate the impact significantly. Our solution integrates with third party video management, GIS systems, alarms and sensors to provide a complete snapshot of incidents allowing personnels to make a smart decisions while responding to threats.